We were not surprised when we learned that Umi Sushi & Oyster Bar at Pechanga Resort & Casino in Temecula, California, was recognized by USA Today in a national contest in the Best Casino Restaurant category. 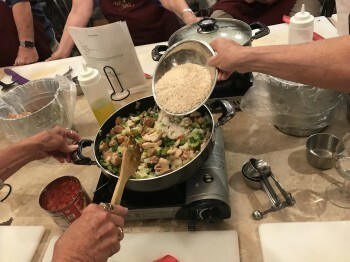 Umi was competing in a field of internationally acclaimed restaurants in Las Vegas and all over the country and came in second in a readers’ poll. Since we are sushi and seafood lovers, Umi has been a favorite restaurant of ours ever since it opened several years ago. 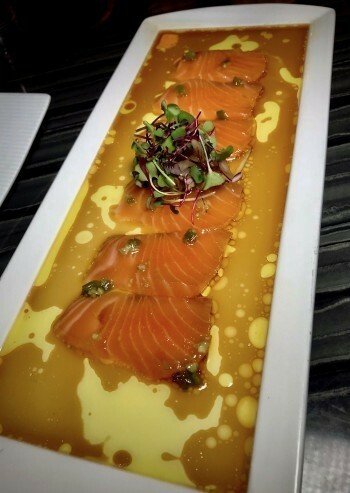 We love Umi because of its innovative, fresh dishes that are so artistically presented. 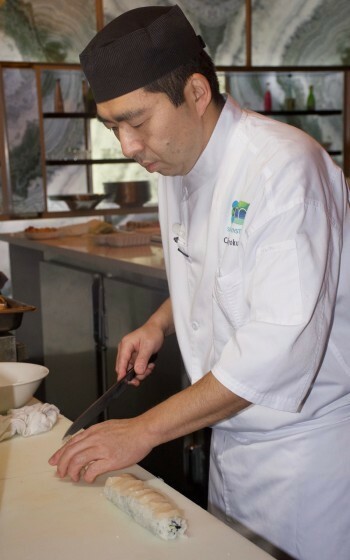 We also especially appreciate the talents of Chef Kiyokuni Ikeda who recently welcomed us to an exquisite dinner at Umi. When we interviewed Chef Ikeda a few years ago, he said his goal was to present the best ingredients simply and creatively and he has done just that. He now heads one of the most exquisite sushi and seafood restaurants—not just in Southern California but in the country. 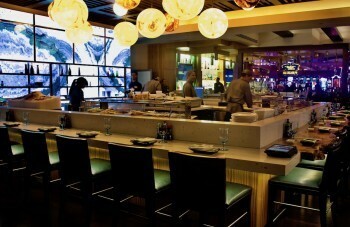 The modern, stylish décor also adds to the upscale ambiance of Umi. We were comfortably seated at a beautifully set table close to the sushi bar where we could watch the meticulous sushi chefs in action. The staff at Umi is always so friendly and knowledgeable. In total, Umi offers a wonderful dining experience, which is why it is so deserving of its recent USA Today recognition. We appreciated the creative cocktail and drink list presented to us on an iPad so we could flip through the pages and consider a variety of tempting, colorful drinks. 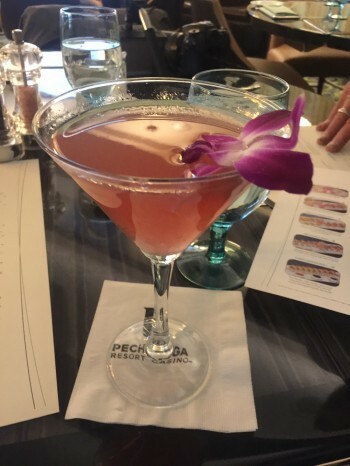 While my husband, Todd, had a traditional martini, our fellow food writer, Linda, had a refreshing cucumber cilantro drink, and I tried a delicious, imaginative cocktail called a Chimera Martini, made of plum sake and blueberry vodka. 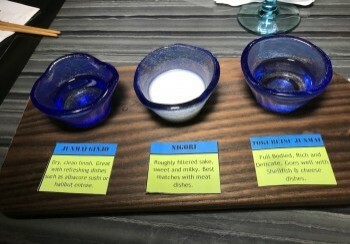 Later Linda and I enjoyed a crispy Sauvignon Blanc from Napa and we all shared a sake flight, which went so well with the seafood dishes. The Poke Tacos are an especially unique and tasty appetizer. 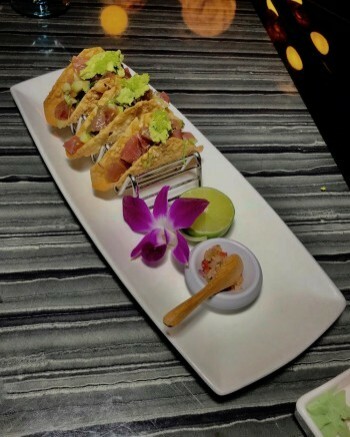 Each crispy wonton shell was full of melt-in-your-mouth, raw ahi tuna, along with chopped cucumber, avocado, and red onion, plus a touch of sesame oil, wasabi, and a dab of house-made pineapple relish. This was a creative take on a traditional taco but much more innovative with a mix of complimentary flavors and textures. Imagine the thinnest slices of salmon (almost translucent) that are marinating in a flavorful mixture of yuzu soy, wasabi, smoky balsamic vinegar, red onion and olive oil topped with sweet micro greens. This is the most lovely, savory salmon presentation you can imagine and it’s also beautiful to behold. (It was almost too beautiful to eat.) And our sips of sake enhanced the dish even more. Umi offers such an enticing menu of Sushi, Sashimi and Maki rolls that it is hard to choose. We know they are all delicious and made with the freshest seafood. Todd loves Spicy Tuna Rolls so that was one of our choices. The tuna had a pleasant tang, which was mellowed by the avocado and cucumber. The chef also made a special roll for us with crab, topped by a sliced scallop and tiny shrimp with crunchy fried tails. My advice to you is to ask one of the helpful sushi chefs what they would recommend, based on your preferences. You could certainly make a meal out of several rolls. This inventive take on corn-on-the-cob could either be a side dish or an appetizer. 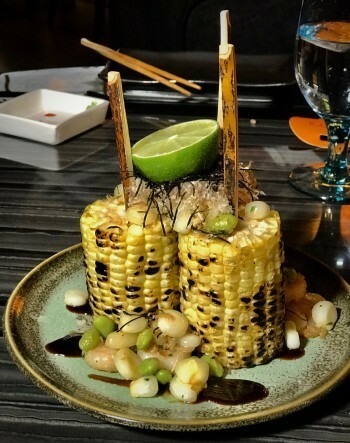 Grilled sweet corn stands on end and is served with mayo, sautéed shrimp, edamame togarashi (mixture of Japanese spices), an Italian cheese called Grana Padono, shredded nori (Japanese seaweed), bonito fish flakes, and a special Japanese sauce called okonomiyaki. This unique mixture of flavors combined with the crunchy corn was heavenly. This is a dish you might find at food stalls in Japan. I could just imagine munching on this corn as I meandered along the streets of Tokyo. This sea bass, which had been marinating in miso, may be the best I’ve ever tasted. It was so succulent and subtly flavored with a hint of jalapeno pepper. Served with rice, Brussels sprouts and cauliflower, this entrée is outstanding and paired so nicely with the sauvignon blanc. The chef insisted (and we were glad he did) that we try a ribeye steak that had been dry-aged for 45 days. We don’t think of ordering meat at Umi since the seafood is so spectacular, but this tender beef was special. Cooked medium rare, its flavors exploded in our mouths. 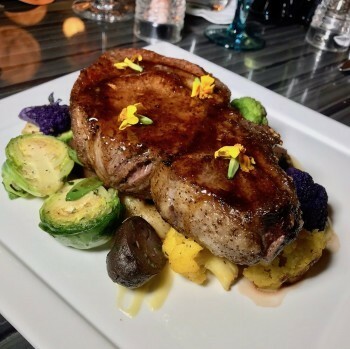 It was a simple steak with a demi-glace, cooked perfectly, and was a nice contrast to the seafood dishes. This is just a sampling of the many imaginative dishes you can order at Umi. On previous visits, I’ve savored the Seafood Steam Pot (full of crab, shrimp, mussels, clams, corn and potatoes) and the crispy Fish and Chips with waffle fries. And someday I’ll splurge on the fresh Maine lobster with miso chimichurri. The Raw Bar includes shrimp cocktails, oysters on the half shell, oyster shooters, oysters Rockefeller, fried oysters and Sapporo clams. There are also delectable dessert options, but, alas, we were too full for dessert this time. Fortunately, there will always be a next time at Umi.